Wireless transmission of images from a video laryngoscope or other equipment to a computer monitor via a receiver connected to the computer. Images can also be recorded to the computer hard disk. Air View is a wireless imaging transmitter allowing images to be sent in real time, without delay (30 frames /second)*. * Connected to a monitor. Time lags may result depending on performance of the computer CPU. The transmitter is powered by a rechargeable lithium polymer battery. When fully charged, it can transmit continuously for about 1 hour. 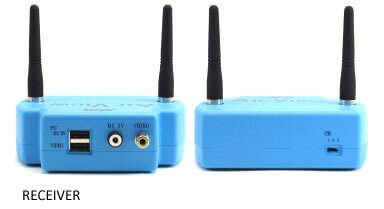 In addition to being able to send wireless images to an external monitor, the receiver can be connected to laptop via a USB cable and images can be recorded to the hard disk. Wireless radio wave frequency is in the 2.4GHz spectrum. AirViewTX Transmitter, AirViewRX Receiver, Receiver Antenna x 2, AC Adapter (5V) x 2, USB cable x 2, Transmitter mounting belt x 2 and software. Channel Frequency Channel frequency (center frequency by channel. When switching from Stand-by mode to transmission mode, the video signal is detected and video transmission begins. When the video signal is interrupted, it returns to stand-by mode. Battery charge is shown with an LED indictor. Note: When the battery is low, the red light will remain on for about 20 minutes and then go out. When receiving power from the USB port on the computer, 2 USB cables are needed. One for capturing images, and one for power supply. When using the AC adapter, the USB cable for power supply is not required. Video Output (USB Cable) Output is managed with included software. If video output to the computer is not desired, the USB cable for capturing images does not need to be connected. The lithium polymer battery has constant current and constant potential charge of 4.2 V, 0.7 C (320 mA typ) in order to prevent excess voltage or over charging. The lithium polymer battery has a temperature detection circuit to detect the upper temperature limits. When the upper temperature limits are detected, the battery is protected by recharge shut-off. When in stand-by the electric current in the transmitter is approximately 0.5 mA. When not in use, turn the power switch to the OFF position. When in the OFF position, the only electric current from the lithium polymer batter is leakage current (less than 1µA). With the switch ON and no video input signal to the video input adapter (3.5Ø Mini Plug), the transmitter will be in stand-by mode (waiting for video input). Power consumption in this mode is less than 0.5 mA. When a video signal is detected, video transmission will begin. When the video signal is interrupted, the transmitter will return to stand-by mode. During video transmission, if the battery voltage drops below 3.3V, transmission will be stopped until the battery is recharged.（The LED indictor is red. With transmission stopped, the red light will remain on for about 20 minutes and then go out.） If left in this state, when the battery drops below 3.15V, power to the image transmitter will be shut off (shut down mode) and the better protection function will active to prevent over discharge of the lithium polymer battery.